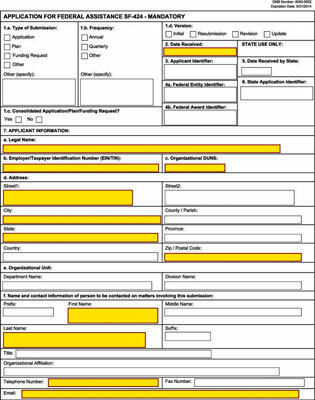 The electronic Application for Federal Assistance Form (also known as SF-424) asks for four pages of information before processing your grant request. Here, you will find an overview of the sections you can expect to see when you’re filling in the SF-424 online. Section 1a: Type of Submission. Your options for this section are “Application,” “Plan,” Funding Request,” or “Other.” The typical response selection is funding request. Section 1c:Consolidated Application/Plan/Funding Request? Although you can mark either “Yes” or “No,” most agencies pre-check the No box. 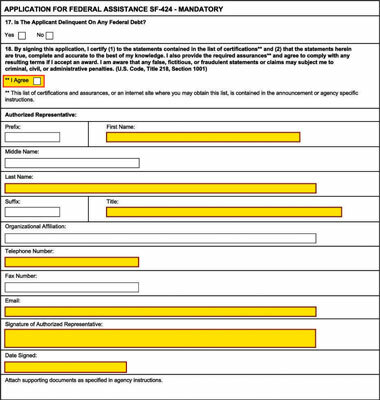 If the No box isn’t pre-checked, call the funding agency and ask for an explanation of what type of information must be included on the form if you check the Yes box. Section 1d: Version. Your options are “Initial,” “Resubmission,” “Revision,” or “Update.” The Initial box is checked off for grant applications submitting their application the first time for a specific funding competition. The Resubmission box is for grant applications that have been previously reviewed and are being resubmitted. The Revision box is for when you’re requesting additional funds for a current award to expand the scope of work. The Update box is for when you need to make changes to your initial grant applications before the grant application closing. Section 2: Date Received. This section will be completed by Grants.gov upon submission. Section 3: Applicant Identifier. Enter the entity identifier number or your application control number. Note: You likely don’t have a number to enter here if your application isn’t a revised or continuation application. Section 4a: Federal Entity Identifier. If you’re a new applicant, leave this section blank. Section 4b: Federal Award Identifier. Leave this section blank if you’re a new applicant. If you aren’t a new applicant, you received this number from the federal funding agency. Section 5: Date Received by State. This section is for state use only; it comes into play when a state agency has to do a review/approval prior to you submitting the grant application to the feds. Section 6: State Application Identifier. This section is also for state use, but only when you have to submit your application to a state agency before sending it to the federal funding agency. Section 7: Applicant Information. This part is a clear and to-the-point section about your organization. Enter the organization’s legal name; the employer/taxpayer identification number (EIN/TIN); the D-U-N-S number; the street address; the department and division names; the name, title, and contact information of the contact person for your grant application; and the organizational affiliation. Section 8a: Type of Applicant. 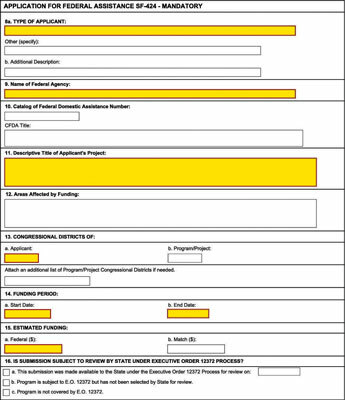 In this section, you see a drop-down window where you can select from the following options: nonprofit, for-profit, institution of higher education, local education agency, state education agency, state agency, and just about every other eligible applicant citatory that you read about in the Notice of Funding Availability’s summary and guidelines. Section 9: Name of Federal Agency. In this section, you type in the name of the federal funding agency you’re submitting your grant application to. Section 10: Catalog of Federal Domestic Assistance Number. You can find this five-digit number in the Funding Opportunity Announcement Summary. Section 11: Descriptive Title of Applicant’s Project. This section is where you spotlight the fantastic name you’ve selected for your grant-funded project. Section 12: Areas Affected by Project. Don’t just list the city, county, and state where your organization is located; list the cities, counties, and states where you provide services and where your target population is located. Section 13: Congressional Districts. Remember to include all the districts that your target population resides in, not just the one where your organization is located. A new feature in this updated SF-424 is the Add Attachment option where you can attach an additional list of program/project congressional districts if needed. Section 14: Funding Period. Here you enter the start and end dates for the funding period. Section 15: Estimated Funding. Type in the amount you’re requesting from the federal grant-making agency, your organization’s contribution, and any other expected contributions, such as state, local, and other revenues as well as potential program income amounts. You also have to total the amounts. How do you know which option is right for you? Go to Whitehouse.gov. Section 17: Is the Applicant Delinquent On Any Federal Debt? The answer is either yes or no. If it’s yes, you have a lot of explaining to do! Section 18: Signatory box. Simply mark the I AGREE box and type in the name, title, telephone number, fax number, and e-mail address of the organization’s authorized representative. The signatory and date boxes are located in the middle of this page. On Pages 4 and 5 of the SF-424 are open information field entry boxes to add your response for the Consolidated Application Plan/Funding Request. Most agencies include a form instructions page where you’re instructed to leave this section blank. Questions about when to fill in this section should be directed to the funding agency well before the grant application deadline.